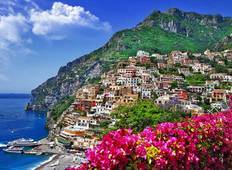 "The amalfi and positano days were pretty boring and possibly could use more suggested..."
"Great trip with amazing hotels and packed with awesome sightseeing tours! Amalfi..."
"I went on an Italy Top Deck tour for a week and went through Rome, Florence, Sienna..."
"The 4 star hotels were quite nice (definitely not 5 stars) but perfectly located..."
"Very well organised, the guides we had were helpful and informative. I was very impressed..."
"This is definitely the best way to do the Amalfi Coast if you are 25 and under. The..."